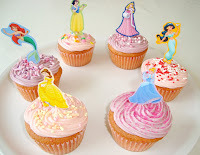 Disney Princess Cupcakes won by a vote or two. I love decorating cupcakes, especially if they child-themed. 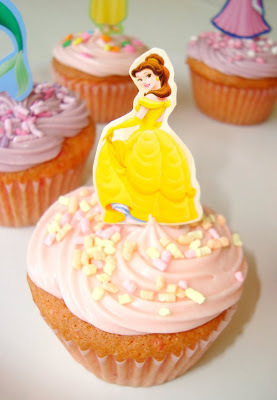 To add a princess to every cupcake, I used Disney Princess stickers. You get those for free when you buy zwieback biscuits here in Holland, and I eat quite a lot of those so I had saved up a bunch of stickers. Everything else is done with buttercream frosting and lots of sprinkles. 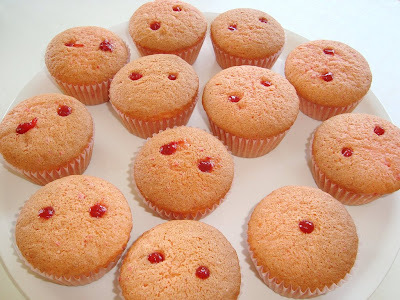 I used a yellow cupcake recipe, made it pink by adding red food coloring and filled them up with strawberry jam. These cutie-pies sure brighten my day! - Preheat oven to 350°F/180°C. Butter the cups of a standard (12-cup) muffin tin. - In a small bowl, whisk together flour, baking powder, and salt; set aside. In a liquid-measuring cup, mix milk and vanilla; set aside. - In a large bowl, with an electric mixer, beat butter and sugar until light and fluffy, 3 to 4 minutes. Add eggs one at a time, beating well after each addition. With mixer on low speed, add half of dry ingredients, followed by milk-vanilla mixture, then remaining dry ingredients. Do not overmix. - Divide batter evenly among prepared muffin cups (a 2-ounce or ¼-cup ice-cream scoop is good for this). 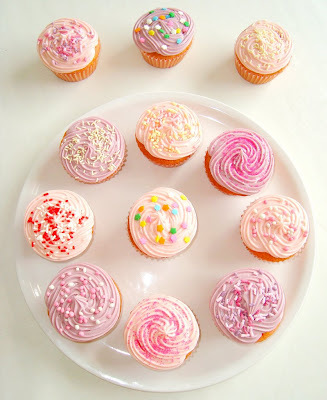 - Place tin on a rimmed baking sheet; bake until a toothpick inserted in center of a cupcake comes out clean, 20 to 25 minutes. Cool cupcakes 5 minutes in tin, then remove and cool completely on a rack before icing. - Sift the confectioners's sugar into a medium bowl. - Mix until the frosting has a slight dropping consistency. Add food coloring, one drop at a time, until you have the desired color. 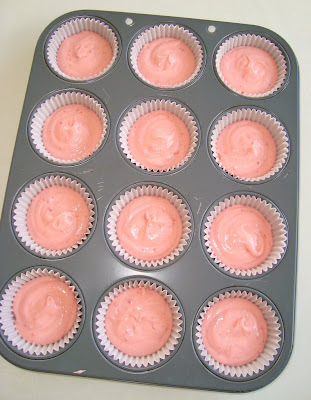 Cupcakes waiting to be baked. 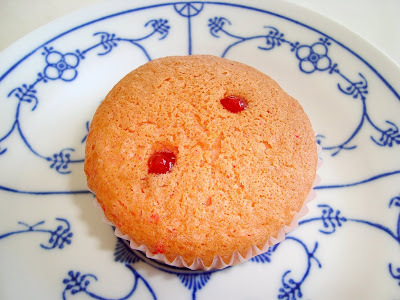 Filling a cupcake with strawberry jam. The reason why I didn’t fill the jam in the middle, is because the toothpick will be inserted in the middle. I wish I had these when I was a little girl, I'm sure I would have loved them! Belle is my favorite Disney Princess … because she gets to live in a French castle with her dream man!!! I must blog about these later. I've been at Disney a lot this month too. In US or still in Europe? look so Yummy and Very Pretty. 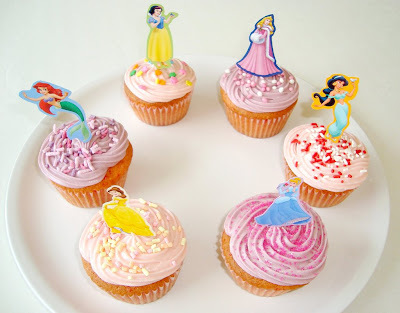 I love Cupcakes and the Disney Decoration is very nice. @Anonymous: Very nice! Up until I tried 'Magnolia Bakery's Vanilla Cupcakes', it was my favorite.